Vinyl-records arouse passion, a characteristic that takes again an important position in the digital age. We produce 7″, 10″, 12″ vinyl-recods in various grammages. Picture-discs and packings belong to our service as well as professional Pre-Mastering and Artwork. For the Vinyl record audio material we require a Premaster on CD or DAT – for printing of graphic-data Freehand, Photoshop oder Quark Xpress format. Check-out the right sizes for Labels and Sleeves under specifications. For further information or personal consultation please don’t hesitate to call. The box-bag is the classical known LP Cover. There are various editions, with perforation, different qualities, etc. The album is the typical packing of the double-LP. Also 4 colour-printed and 4-sided fold-out-able. The packaging of Vinyl is in general done manually. Vinyl-colours – various numbers of colours are realizable. Covering colour-mixes have a higher inherent noise because of the utilisation of appropriate colourants. The analog audio-material will be engraved into a first plate. 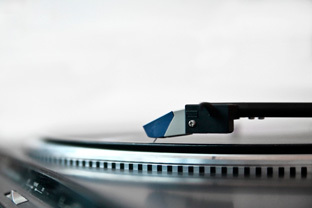 The equipment functions principally opposite to the vinyl player. A diamond cutter transmits the grooves in the material, a foil or copper plate. These different techniques vary in sound and manufacturing process as described below. The sensitive foil process, would be accomplished in 4 working steps in the galvanism, up to the pressmatriz. Normally, misprinting unfortunately occurs in such copying procedures. On the other hand, the copper plate, as a result of the DMM-procedure (Direct Metal Mastering), is already sturdy enough to manufacture stampers. Hence, the DMM-procedure is the means of choice, unless if the audio-material cannot be transcribed in this way. The possibilities of the Vinyl cuts are physically limited, as the loudness of the audio material and stereo intensity influences the width of the rind and depth of the writings. Under some circumstances, a special pre-mastering is necessary for vinyl printing.